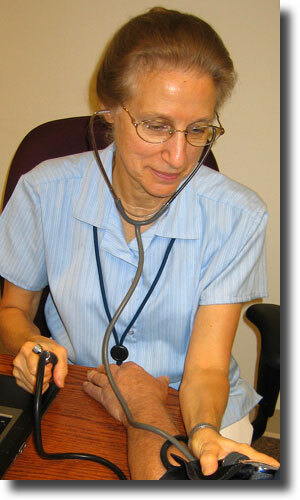 Wellness Nurse Ferne Motto is on hand daily to take blood pressures and organize wellness activities and programs on campus. Fairmount is pleased to promote wellness as a life style choice with our residents and team members. We believe that taking even small steps toward a healthier lifestyle can make a big difference in a person’s well-being. Studies have shown that many major health problems are the result of life style choices, and are preventable. By offering a variety of lifestyle improvement and wellness options, team members and residents can participate in programs that help increase physical activity, improve their nutrition, manage their weight and make positive changes to their lifestyles. In addition, employer-sponsored health insurance is a team member benefit that not only pays for needed medical care, but also offers a range of educational programs through our insurance carrier to promote wellness and healthy options. In addition to wellness and lifestyle improvement programs, Fairmount promotes resident wellness through a program called Home Care Services. Home Care Services is a licensed home care agency operated by Fairmount that provides opportunities for residents to take an active part in maintaining their health and well-being. An array of social and physical activities, along with wellness screening and healthy lifestyle initiatives, assists residents to remain active and healthy. Transportation on campus and into surrounding areas promotes and enhances the connection between residents and the larger community.